You’re used to being told what you shouldn’t do when the market is falling. Today I’d like to talk about the right things to do in a volatile market. Before we discuss the right things to do in a falling market, a quick reminder that the market is cyclical. That means it will go up AND down. As much as we would all love the market to go up all the time, that’s just not realistic. So what is realistic? Market history shows that declines of 5% occur in 19 out of every 20 years. Declines of 10% or more occur more than every other year, declines of 20% or more occur one in five years, declines of 30% or more occur one in twelve years and declines of 40% or more occur one in fifty years. 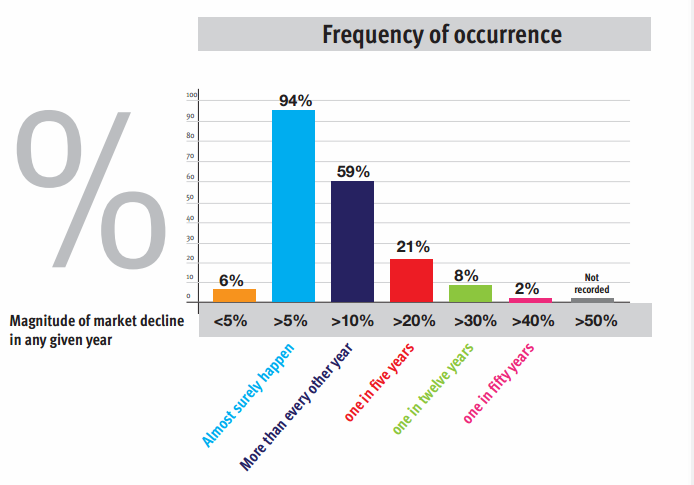 Based on this data, declines in the market are not only possible, they should be expected. So instead of panicking every time the market goes down, why not take advantage of it? The first thing you should do when the market is falling is to review your portfolio to make sure it matches your risk tolerance, time frame and goals. If it doesn’t, then some rebalancing may be in order. Most people have a pretty good idea of whether they are an aggressive or conservative investor. However, if you’d like some help with this, there are many risk tolerance forms online such as Vanguard’s tool at https://personal.vanguard.com/us/FundsInvQuestionnaire. At times like this it’s not unusual for people to want to take their money out of the stock market and park it in CDs or money markets or even under their mattress. However, it’s important to remember that you need some growth in your portfolio in order to stay ahead of inflation (especially since most savings and money market accounts are paying less than 1% these days); however, you can take less risk in your portfolio and still earn moderate returns over the long run. Here’s a chart of various portfolios (based on the percentage of stocks vs. bonds) for the period ending December 31, 2014. As you can see someone who had 40% stocks and 60% bonds earned the same amount as someone who had 80% stocks and 20% bonds over the 10-year average period. Sure the more conservative investor made less during the raging bull market of 2009-2014, but the long-term growth of your portfolio is what matters, not what you made last month or last year. Another benefit is that the more conservative investor lost much less than the more aggressive investor. From the table you can see that the person who had 80% stocks lost 32% in the worst 1-year period (2008), while the person who had 40% stocks only lost 10% during that same time period. Yes, you read that right. I said “time the market”. But we’re going to do it the right way, not the wrong way. The wrong way is selling at the bottom and then jumping back in after the market has already recovered. Studies show that people who try to time the market lose an average of 50% more than people who stick with their investment plan. Having said that, what if you need to rebalance your portfolio because it doesn’t match your goals? Or what if you are retired and need to raise cash for next year’s living expenses? You may need to make some changes when the market is down, whether you want to or not. However, you can be strategic about when you make those changes. As you can see from the following chart, the market is very volatile right now. Much like the weather in Missouri, if you don’t like it, wait a few days and it will change. With large swings in the market, you should try to time any selling on the up days rather than selling on a large down day. While it’s not as ideal as waiting for the market to recover from its current correction, its far better than selling at the bottom and locking in large losses. On the flip side, if you’re young and have a long way to go until you retire, you should take advantage of the down market to buy more stock (see Buy Low, Sell High below). So instead of timing the market in a bad way (and locking in losses), you can take advantage of the low market to increase your portfolio over the long run. If you are still many years away from retirement, you should be glad the stock market is down! Remember, when the stock market is down stocks are on sale. Which would you rather pay… $100 for a new pair of shoes or wait until they are marked down to $50? $50 of course! That’s exactly the same mindset you should have when it comes to the stock market. If you are investing regularly in a 401K, you are already doing this (it’s called dollar cost averaging and it basically means that you are buying more stocks when the market is down and less when the market is up). However, you could be more proactive and invest even more in the market when it is down by increasing your 401K contributions, investing in a Roth IRA or just by buying a stock mutual fund. People who are already retired or close to retirement should aim to have the next 12-24 months of living expenses in cash. This is to help keep you from having to sell when the market is down. If you have a large pension or your Social Security benefits cover most of your living expenses then you may not need as much cash, but in general retirees should try to maintain 1-2 years of living expenses in cash. The best way to do this is to save any current surplus (if you are still working or if your monthly income exceeds your expenses). However, if you need to raise cash to meet this rule of thumb, remember to do it strategically as described above. A downturn in the market could be an opportunity to reduce your taxes. If you have investments outside of retirement accounts, consider taking losses for tax purposes. This is especially helpful if you have a large holding in one stock or one mutual fund that you’ve been meaning to reduce. Just remember to avoid the wash sale rules, which state that losses will be disallowed if you sell a security and immediately purchase a substantially identical security. For example, if you sell 100 shares of Walmart stock to take the loss for tax purposes you must wait at least 30 days to purchase new shares of Walmart stock. However, you can invest in a different company or a large cap stock mutual fund without triggering the wash sale rule. Also, this works best when you have capital gains to offset. Remember that you can only deduct up to $3,000 of capital losses against ordinary income (wages, pensions, Social Security, etc.) so the benefits of tax loss selling can be limited. Another way to take advantage of a lower market is to do Roth IRA conversions. When you convert money from a traditional IRA to a Roth IRA you have to pay taxes on the entire amount converted. So if you have a $10,000 IRA that you’ve been wanting to convert and the value of that IRA has gone down to $8,000, converting at the lower value will reduce your taxable income by the decline in value of the IRA. There are many different types of investment costs. Mutual funds have an annual operating expense, you may pay transaction fees when you buy and sell investments, or you may pay a monthly or quarterly fee to an investment manager. These fees may not seem like a big deal when the market is going up, but when you are losing money you may want to rethink the investment fees you pay. High fees can have a large impact on your portfolio over the long run, so you should minimize your fees whether the market is going up or down. Annual operating expenses on mutual funds can range anywhere from 0.08% all the way up to 2.5%. While some actively managed funds (with higher fees) actually earn those fees, it’s hard to outperform the market over a long-term consistent basis. With that in mind, consider investing in low-cost index funds or exchange traded funds (ETFs). If you are working with an investment manager, you could be paying anywhere from 0.5% up to 1.5% annually to that manager. Again, some investment managers do a great job and are earning that fee, but many others aren’t even keeping up with the market. You should review the fees you are paying and determine if you would be better off investing on your own or working with a fee-only financial planner (who charges by the hour or project instead of based on your asset value). “Many investors don’t realize that a large percentage of their long-term investing gains are made during a bear market. A bear market is the time to be pouring money into the market, buying low, rather than taking it out. Thus, it is a great time to defer some of your major purchases. This is not the time to buy a new car, purchase that boat you’ve had your eye on, remodel the kitchen, or take that dream trip to Tahiti. This is the time to fund your Backdoor Roth IRAs, accelerate your 401(k) contributions, start that taxable investing account “. This is an expert from Physician’s Money Digest’s article 6 Things to Do in a Bear Market. This advice can apply to both retirees and people who are still in the accumulation phase. If you are retired, you should try to avoid taking large withdrawals when the market is down. If you had a family vacation, home improvement or other large purchase planned and the market declined right before you needed that money you should try to delay the purchase until the market has recovered. I know this is easier said than done, but it could make the difference between running out of money during your lifetime or not. Okay, so that was really a “don’t” not a “do”. So here’s the thing to “do” part: If you’re in the accumulation phase, consider using funds that were designated for large purchases for investing instead. I realize that investing when the market is down isn’t nearly as fun as taking a beach vacation or buying a new car, but it can boost your long-term returns significantly. The average intra-year drop since 1980 has been 14.2%, yet annual returns have been positive in 27 of those 36 years. Over a 10-year period, an average investor in the S&P 500 index would have experienced positive returns 95.1% of the time. A review of all 20-year periods from 1950-2015 showed an average annual return of 8.9% per year for a 50/50 portfolio, with 5% as the lowest annual return for that time period. If you consider that the US economy experienced a major recession during this period, this return becomes even more impressive. So while we may be in a correction right now, it’s the long-term that matters not what the market does today or this week or even this month. And finally, if you have any questions or would like to review your portfolio, please don’t hesitate to contact me.